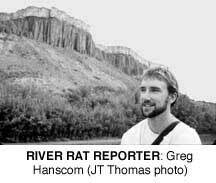 Our cover story, written by associate publisher Greg Hanscom, is the last in a three-year series on the Rio Grande. It's been quite an education. While HCN has a long history with the geography and politics of the Colorado River, the Rio Grande has always been something of a mystery to us. That started to change three years ago, when Hanscom headed out on his first journey along the river (HCN, 10/11/99: Imagine a River). As he recalls: "I drove over Monarch Pass in a terrific blizzard - headed for Pilar, N.M., to talk to 'Uncle Steve' Harris - the man with the river in his head. I left Harris' house carrying a stack of newspaper clippings and books, and more confused than when I arrived." Since then, Hanscom's made three other trips down the river, talked to dozens of activists, agency officials and academics, and, with the help of a handful of freelancers, slowly pieced the river and its stories together: the mined-out watershed, the battle over the silvery minnow in the Middle Rio Grande Valley, the looming water crisis in El Paso and Juarez, and finally, the present crisis on the U.S.-Mexico Border. Now that HCNhas a firmer grip on the Rio Grande, we don't expect to let go. Like the battles over the Colorado River, the struggle to restore the Rio Grande in the face of immense human pressures will continue to draw our attention in the years ahead. We thank the New Mexico-based McCune Foundation for funding our expanding view of the West. A complete collection of the Rio Grande stories can be found on our Web site. Three High Country News subscribers, Ivan Doig, William Kittredge and Annick Smith, are among the authors of the 10 books, ranked by Montanans as the best about their state. Ivan Doig's This House of Sky pushed the late Joseph Kinsey Howard's Montana: High, Wide and Handsome down to number two (it was number one 20 years ago, when the last survey was done), and A.B. Guthrie Jr.'s The Big Sky from two to three. Doig's book had been number four in 1981, when Harry Fritz, a professor of history at the University of Montana, last did the survey. A newcomer to the list was The Last Best Place: A Montana Anthology, by William Kittredge and Annick Smith. The rest of the top 10 list is A River Runs Through It and Other Stories by Norman Maclean, Montana: A History of Two Centuries, by Michael P. Malone, Richard B. Roeder and William L. Lang; Montana: An Uncommon Land, by K. Ross Toole; Tough Trip Through Paradise, by Andrew Garcia; Fools Crow, by James Welch; and Winter Wheat, by Mildred Walker. If you don't agree with the ranking, you will get a shot at changing it in 2021, when Fritz will do the next survey. For this one, about 14,000 survey forms were placed in Montana: The Magazine of Western Historyand other publications; 486 Montanans responded. Winter is always a slow period for visitors to our Paonia office. Not only are the roads treacherous with snow and hungry deer, but people in general seem partial to their homes, as they await the first signs of spring. We're all for local community-building, but we sure do appreciate seeing a few new faces. Lafayette, Colo., reader Peter Sartucci dropped by the office in late January. Sartucci's specialty is appraising conservation easements. He figures out what a piece of land is worth, and what it will be worth when the development rights are sold off. He says he's one of just a handful of appraisers in Colorado who make a living almost entirely on easements. Subscriber Jacob Smith stopped in en route from the Utah canyon country to his home in Boulder, Colo. Smith, who works part-time for the Wildlands Center for Preventing Roads, is the founder of the Center for Native Ecosystems, which keeps an eye on threatened plants, bugs and other beleaguered but homely species that don't get much attention from national environmental groups. Colorado Wild executive director Jeff Berman took time out of a harried day of meetings in Aspen and Paonia to offer insight into the Ski Area Citizens' Coalition Environmental Scorecard, which rates the environmental performance of ski areas in the West. Then, he rushed off to a meeting of the Western Slope Environmental Resource Council, before heading home to Durango. Look for more on the ski coalition's scorecard in an upcoming Bulletin Board item. Congratulations to subscriber Hank Deutch for his receipt of the Sierra Club's Woody Award for stories about the Upper Middle Fork of the Saline River in Arkansas' Hot Springs Village Voice. Deutch is a retired Forest Service public affairs officer. A reader called in to inform us that we had misspelled the name of the Southern Ute Academy's principal in Michelle Nijhuis' story on vanishing Native American languages (HCN, 1/21/02: Finding the words): She is Carol Olguin (not Oguin). And John Shurts, who teaches at Lewis and Clark College in Portland, informed us that we goofed on the spelling of the new Northwest Regional Director of the National Marines Fisheries Service in our story about the controversial court ruling on Oregon coastal coho salmon (HCN, 12/3/01: Ruling ripples through salmon country). He is Bob Lohn (not Lawn). The mistake, says Shurts, who is a friend of Lohn, was "the occasion for much mirth around here." If only all our mistakes had such an effect.